Hello! Today I'm finishing up our adventures of Day Two in Springfield, Missouri. After our morning at the Springfield Botanical Gardens, Bass Pro Shops, and the Smallin Civil War Cave, we finished our day by exploring downtown Springfield. Now, I always like to visit the historic downtown's of any city I visit, I love to look at all the old buildings and learn about the history of the town, but this downtown was a real disappointment to me. We started out our adventure by looking for a historic foot bridge we had read about in a brochure only to find that at the base of it, it was filled with homeless people, one of whom decided to urinate right in front of us. We decided to keep walking. We were very disappointed to see either a lot of run down shops, empty shops, and a seedy hotel. They obviously let their downtown area disintegrate and it was very sad to see that. We did however find a very nice homemade chocolate factory called Askinosie Chocolates which specializes in using only local cocoa beans and makes their chocolates right on site. We started to worry about our car because we were traveling and had some valuable inside, so we decided to stop walking and head back to where we had parked. We drove around for a little bit and found the 'Town Square'. This was a much nicer area than where we were previously at, yet, it still lacked interesting shops and businesses. This is the fountain of the town square which is also the site of a historical Springfield Battle during the Civil War. Here is my family reading about the battle. 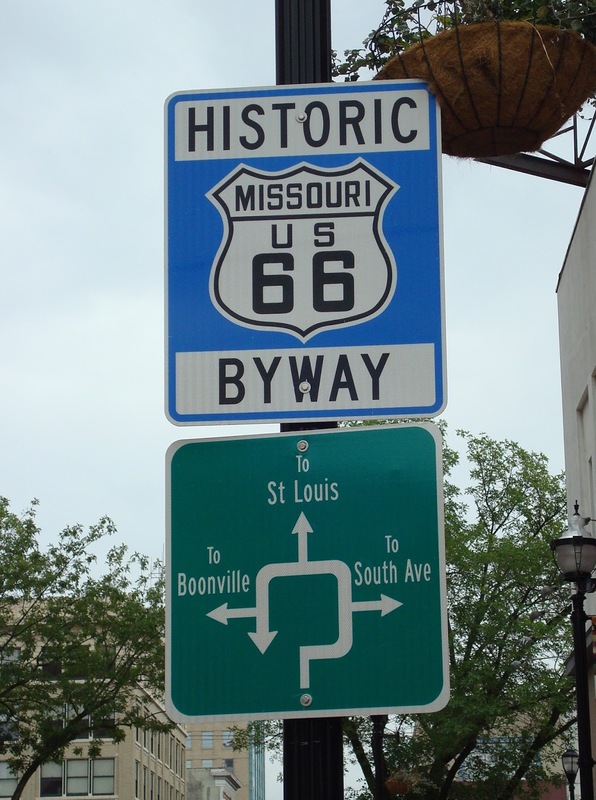 There were numerous historical markers around the town square available for tourists to learn about the town's history. Even though I had read in brochures about certain museums, I really didn't spot any on our walking tour, and frankly, it was the end of the day and I didn't think any would be open much longer to make it worth the admission fee. And, growing up in a large city where I visited the Milwaukee Public Museum and the Chicago Museum of Science and Industry regularly, I didn't think Springfield's Museum could compare, so we didn't look too hard. We did however find their small public library and were quite impressed with that. Even though it was small in size it was very modern and reflected current technology trends. It was filled with plenty of computers that were all being used, and it had a fabulous modern interior design. In addition to all the computer work stations, it had these really neat 'pods' that were an open letter 'O' shape and had comfortable padding inside. You could sit or lounge inside to read your book or connect to the Internet. They were so fun! My kids were actually jealous of this library and wished their hometown library were like this one. As we were leaving the area my husband spotted this bakery and had a good chuckle because 'Amycakes' is one of his nick names for me. 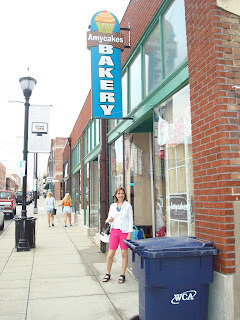 It was closed, so we couldn't get inside, but he insisted on taking my picture underneath the sign. The famous Route 66 does go right through downtown Springfield, so I had to snap a picture of this road sign. And that finally concludes our adventures of Day Two in Springfield. We did a lot on our second day. Day Three wasn't as adventurous. Our son is a huge animal lover and loves to visit zoos. I'm not a big zoo fan, too many strollers and screaming little kids for me, but to make my child happy we went to the zoo. Now, again, I grew up in a large city and I'm use to the Milwaukee Zoo which is considered one of the best in the USA, but this little Zoo in Springfield actually surprised me at how pleasant it was. It is called the Dickerson Park Zoo and although it normally has an admission charge we managed to hit it on a day when admission was FREE! The first thing we all noticed when we walked through the gates was all the Peacocks! They were everywhere! And my what personalities they had. They seemed to be greeting all the guests and were screaming 'Look at me! Look at me!' I'm use to seeing Peacocks on the ground, but I had no idea these big, heavy birds could fly up so high. We spotted them on the tops of building looking down at the crowds, and even in the trees. They were so beautiful and entertaining. Here is a white peacock. Isn't he beautiful? I didn't take many pictures of the zoo, and I only had my cheap portable camera and not my big, professional camera with me because I didn't want to lug it around all day. So, sorry if the pics aren't the best. The zoo was filled with lovely winding strolling paths and bridges. There were many water features and lakes filled with swan, ducks, and fish. The zoo provided food which you could buy to feed the fish and ducks. 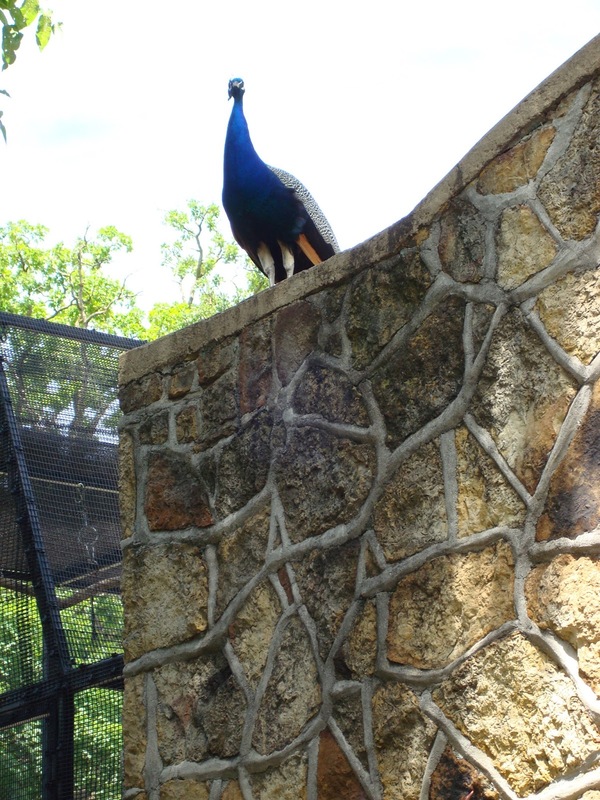 Here is a picture of a peacock standing on top of an animal exhibit. It was very hot that day, so were happy to discover this 'cooling station' where a fine mist of water feels so refreshing. I only wish the zoo had more of them scattered throughout the grounds. This was the only one and I overheard many people complaining of the heat while I was there. That's me in the background with my daughter in the foreground. One of the best features of this zoo which I have never seen at any other zoo that I have been too is how close you can get to the giraffes. They actually have a ramp and balcony that brings the guest right up to the height of the giraffe and then they sell food so that you can hand feed them. The giraffes come right up to you, and eat right out of your hand. It's such a wonderful experience to see these beautiful creatures up close. 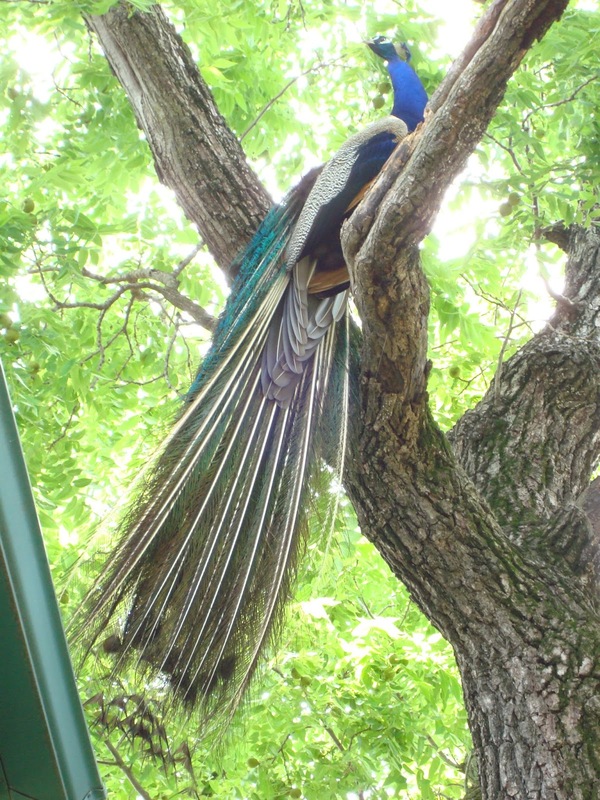 And here is one of our feathered friends up in a tree. What a site to behold! And just a quick shot of the outside of the zoo as we left for the day. The zoo had all the main animals...hippos, elephants, lions, tigers, and bears. We saw them all. It was quite a nice day. After walking all day in the hot sun, we headed back to the in-laws for a dip in the cool pool waters, some Papa Murphy's Pizza, and a DVD. It was nice to just sit around and relax for the evening. And that concludes the end of Day Three in Springfield, Missouri. Superb photos, thanks to share with us ! Wonderful photos Amy, loving those peacocks! The zoo close to us now has the giraffe feeding thing too. They are my favorite wild animals, and it is truly amazing to see them up close. Sounds like you had a fabulous trip. Sounds like you had a good time!! I had to laugh at your comments about the peacocks. (the white one is gorgeous!!) We were at the Bronx Zoo a couple of weeks ago and there are peacocks everywhere there and I think they were all "screaming" at us! We did see a couple of them spreading their wings and they are so beautiful!